Given a choice I would never pick this book. I wouldn't even give it a second look, and I would certainly not struggle to complete it. I knew I wouldn't be able to read it at a stretch. For someone who has followed Sri's blog for more than 2 years now I know that it's not a good idea to read this like a page turner. Innocent scenarios and well carved out story lines, give you the creeps as you turn each page, thinking that it won't get you this time. But it always does, when you least expect it. 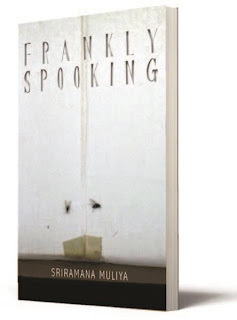 For someone who has always believed that ghosts are a lot more than blood dripping, white saree clad figures floating in thin air, I would say this book is a pleasure for the logical minds. You will not once say what bull-crap, but instead fear that it might happened to you too. Not a fan of short stories, but this book has changed my view towards them. Somehow I always prefer the long and explanatory novel kinds that keep very little to your own imagination, which is probably a big plus for this one, because it leaves just the right amount of space for you to imagine the scenarios. You are picturing yourself in each story, in each really scary story mind you, and it leaves you a little squeamish each time. My personal favorites would be in "Stuck in the Middle", "Team Player", and "Director's Cut". Peevee of the blogosphere reviewed the book here and I couldn't agree more to what she said, do read it. Also the book is topping the chart of bestsellers and is getting all the praise it deserves, I needn't say more. By the end of the book I was terrified of all the things I use in my daily life, including my headphones, elevators and even stuffed animals. So my final verdict: take this book to that overnight camping trip and scare the Bejesus out of your friends or simply cozy up in your bed if you need to pull an all-nighter, cause there is going to be no sleep after you read this. Order your copy at Flipkart or Infibeam Now! The best part is...the author is a blogger and he is amazing!! I am yet to get hold of the book! I wonder if I can get this book from Pakistan!